I am finding the font size for both dialog and pinyin a little small when learning on my phone (S7) meaning that I cannot clearly read the characters and the pinyin tone marks are just a bit too small for me to see the difference between them. I can change the default font size on my phone, but this does not change the dialogue font (only the text for playback speed changes size, and everything else is unchanged). -Can you add a settings tab that allows us to increase the dialog font sizes in your app, so we can read them more easily. Perhaps give one setting for english text and one separate setting for Hanzi, because Hanzi characters have much more detail and an even larger font helps us learners spot the differences. Probably just as valuable for those on web pages too, but it is the app version that stays fixed size and cannot be zoomed in on. I agree that the font is too small on the app. I actually prefer to app to the website due to the “breakdown.” It would be even more useful if users were able to change the font. I can’t speak for web, but this is something Android has had on it’s to-do list for awhile. 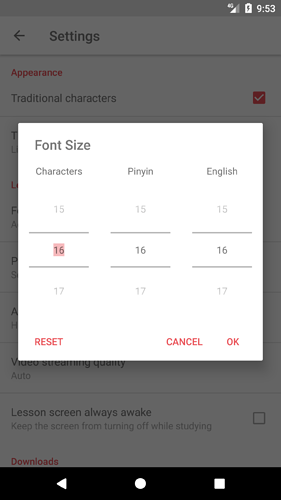 The latest beta release (v2.1.1) now includes the option to set text sizes for characters, pinyin and translations (english). The font size settings only affect text in the vocabulary, dialogue, grammar, and expansion sections as well as the on the breakdown sheet. Production rollout of this update shouldn’t be far away, but if you’d rather not wait I’d be more than happy to DM you a link to the beta version. Either way, let me know if this is what you were looking for or if you have any additional thoughts or suggestions. If you want beta testing and comments from an my early learner viewpoint, then I would be in. This is good news. It makes a great app even better!